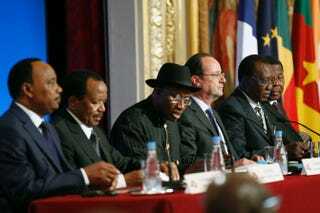 Leaders of African nations, as well as the president of France, met in Paris on May 17, 2014, to discuss Nigeria’s security, including (from left) Nigerien President Mahamadou Issoufou, Cameroonian President Paul Biya, Nigerian President Goodluck Jonathan, French President François Hollande, Chadian President Idriss Deby Itno and Beninese President Thomas Boni Yayi. The terrorist group Boko Haram reportedly abducted the wife of Cameroon's vice prime minister in an attack Sunday that left at least three people dead in the town of Kolofata, Reuters reports. In addition, Kolofata’s mayor, Seini Boukar Lamine—who is also the lamido, or local religious leader—was kidnapped, along with five members of his family, in another attack, according to the news wire. According to Reuters, this is the third time that Boko Haram has launched an attack in Cameroon since Friday. Kolofata is back under the control of the Cameroonian army, but the toll of the attack is still unclear. "We do not have all the facts in order to give full information on the exact circumstances and the victim toll of this attack," Tchiroma announced in a television message to the state, saying that the group had used "brutal and unqualified violence."